The former Mount Rouse Shire Council Chambers are located adjacent to the central intersection of the township of Penshurst. The Chambers are a small symmetrical stone building in a reduced Italianate style, constructed in 1864 and extended in 1887. The original design was by John S Jenkins, an architect and engineer who began his career in Warrnambool, worked for a long time in Hamilton and, having moved to Melbourne, established the firm Jenkins, D'Ebro and Grainger which designed the present Princes Bridge. Jenkins was a founder of the Eight Hour Day Movement. The Chambers' extension, which provided the major hall at the rear of the smaller office building, was designed by another architect, William Smith. The stone work of the building is particularly fine and, importantly, it is of the same standard and detailing throughout both wings. Cr John Mackiehan, Shire President in 1879 was the originator of the concept of a Victorian Municipal Association. He was MAV President from its inception until his death in 1885. The Shire of Mount Rouse was amalgamated with other local shires in the late twentieth century to become part of the Southern Grampians Shire. The buildings are in excellent condition and retain an excellent degree of integrity. They also house one of the best collections of archives and objects of any rural municipality in Victoria. The former Mount Rouse Shire Council Chambers are of historical and architectural significance to the southern Grampians Shire and to the State of Victoria. The former Mount Rouse Shire Council Chambers are of historical significance because their construction and development mark the commencement and continuation of sound local government in the area for over one hundred and thirty years. They are also of historical significance for their direct link with Cr. Mackiehan, founder of the Municipal Association of Victoria. The records of the former Shire survive in the building. The Chambers are of architectural significance for their use of a conservative style and form and as the work of John S Jenkins and William Smith. The former is of particular significance as a shire engineer and, concurrently, as an architect in private practice and later for his substantial work in Melbourne. The building was constructed in 1864 and extended in either 1877, the date given by the Shire's Centenary History or 1887, the date given by the National Estate Register citation. The original design was by John S Jenkins, architect and engineer. The extension, which provided the major hall at the rear of the smaller office building, was designed by another architect, William Smith. 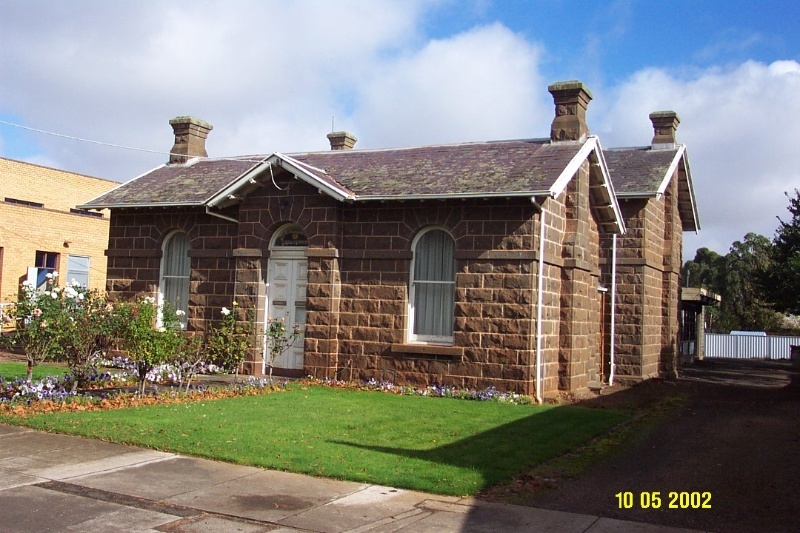 The Council Chambers are a small symmetrical stone building in a reduced Italianate style. The entrance is a slightly projecting section with an arched opening housing a fanlight and a double leaved front door of ten panels. The arched windows are single paned double hung sashes. The arches of the door and windows spring from a dressed cornice otherwise the rock face bluestone is laid in 12" courses. The gable over the projecting entrance is supported by extended purlins. The main roof has a low pitch, contributing to its Italianate style, and is transverse. There are chimneys at either end of the gabled roof. The interiors of the front wing are conventional but the inner glazed vestibule doors are notable as is the strong room off the Shire Secretary's office. The main chamber of the second wing is a particularly fine interior with an open ceiling and exposed queen post trusses. The stone work of the building is particularly fine and, importantly, it is of the same standard and detailing throughout both wings. Old photographs show a simple picket fence in front of the building. Much of the former Shire's documentation and some other memorabilia survives in the building.